Dr. Robert Foster is teeing up another possible home run as the new CEO of ContraVir Pharmaceuticals (NASDAQ:CTRV) and its lead programs for liver disease arising from chronic viral infection and NASH (non-alcoholic steatohepatitis). He joined ContraVir as CSO in 2016 after the company acquired his startup, Ciclofilin Pharmaceuticals. Dr. Foster’s resume includes discovering the immunosuppressive drug, voclosporin, at Isotechnika Pharma and then refocusing its development to lupus nephritis after he acquired Aurinia Pharmaceuticals (NASDAQ:AUPH) in 2013. Aurinia expects to report Phase 3 data for voclosporin at the end of 2019. “ContraVir is reminiscent of my past 30 years at Isotechnika, Aurinia and Ciclofilin,” Dr. Foster recalls. After moving into the executive suite at ContraVir in October 2018, Dr. Foster conducted a full review of the company’s development pipeline and corporate strategy. Critical evaluation of its drug candidates from scientific and commercial standpoints revealed untapped potential. A thorough analysis demonstrated a strong therapeutic potential for ContraVir’s drug candidate, CRV431, not only in viral hepatitis but also other diseases of the liver. In preclinical studies on hepatitis B, CRV431 had shown the potential to block hepatitis B virus (HBV) entry into liver cells and complement current HBV treatments by reducing multiple markers of infection. This contrasts with current treatments, which usually only reduce HBV DNA. In addition, studies in non-viral models had demonstrated that CRV431 also could reduce progression of fibrosis as well as the number and size of liver tumors, or hepatocellular carcinoma (HCC). Fibrosis and HCC develop in many liver diseases and are primary concerns in the rapidly growing condition of NASH. With CRV431 as a cornerstone, ContraVir will now focus on the development and commercialization of therapeutic drugs for the treatment of chronic hepatitis B and NASH. Each disease afflicts approximately 250 million people worldwide, and industry analysts suggest that global sales of HBV and NASH treatments each could exceed $200-billion during the next 20 years. Approximately 25% of patients with chronic hepatitis B die prematurely from liver failure, cirrhosis or liver cancer. Contravir’s second development program is TXL (tenofovir exalidex), a liver-targeting conjugate of tenofovir for chronic HBV. Dr. Foster says TXL is a Phase 3-ready compound with a 505(b)(2) pathway with the FDA. It is further advanced than CRV431 but “we’ve decided to make it available for partnering in return for milestone payments and future royalties.” The company is having discussions with a number of groups in North America and Asia. “Our studies have shown TXL has potent antiviral activity at lower doses than Gilead Sciences’ HBV treatment, Viread (tenofovir disoproxil fumarate), and has a strong safety profile, with the potential for decreased bone and kidney toxicity due to increased liver targeting,” he points out. TXL also has favorable pharmacokinetics, compared with Viread, with significantly lower levels of circulating tenofovir in the blood. “Overall, we believe that the observed properties of CRV431 are very compelling and are pointing us in the direction of redefining ContraVir more as a company addressing liver disease, rather than being strictly focused on the treatment of HBV. Aligning our vision with liver disease treatment ought to build significant value for the company,” Dr. Foster contends. HBV and NASH are both risk factors for the development of liver disease, including fibrosis, which is why “we are aiming to target both HBV and NASH,” he adds. ContraVir recently completed Phase 1 testing with CRV431 and expects to begin a proof-of-concept HBV trial in December, with data expected in mid-2019. The 28-day study will assess safety, tolerability, pharmacokinetics, and preliminary signals of antiviral efficacy, as well as identify clinically relevant biomarkers of CRV431 in combination with Viread. According to Dr. Foster, CRV431 targets common pathways to end-stage liver disease. Liver injury usually begins with alcohol, viral hepatitis, or NASH, with progression to inflammation and fibrosis, ultimately ending with cirrhosis and/or cancer. “A cure for HBV is a challenging goal, although drug combinations ultimately should be able to control the virus and improve the health of patients,” he suggests. For example, some work now is being done to interrupt the viral life cycle, including reducing the viral load, reducing viral antigens, stimulating immunity, and altering virus trafficking. But the limited efficacy of current antiviral treatments towards a cure highlights the need for new therapies in HBV, he adds. Dr. Foster explains that HBV produces high amounts of antigens, including surface antigens, which may exhaust the immune system’s T-cell response that would normally attack the virus. 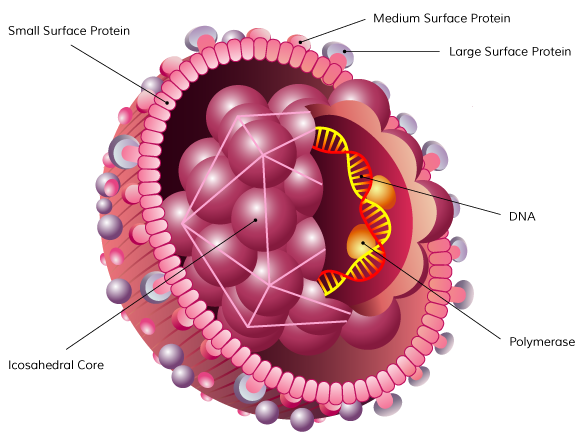 “CRV431 has demonstrated multiple activities that are linked to the way the drug candidate is designed to target host proteins, called cyclophilins, to reduce HBV surface antigens and other proteins, and to stimulate an innate immune response, bringing us one step closer to creating the potential for a functional cure,” he points outs. ContraVir also has studied combining CRV431 and TXL, finding significant reductions in HBV DNA in transgenic mice, which suggests additive-to-synergistic efficacy. The combination also demonstrated a reduction in surface antigens. NASH, which involves inflammation of the liver, can cause serious problems such as fibrosis, cirrhosis and liver cancer. It also represents an unmet medical need, with no approved drug treatments currently, and an estimated global prevalence of 4% of the population and growing. HCC is the fifth most common cancer in men and seventh most common cancer in women. The annual global incidence of HCC is more than 500,000 and the five-year survival is about 10%. The Stelic Institute in Japan and Prof. Philippe Gallay of Scripps Research Institute in San Diego have conducted NASH studies with oral administration of CRV431 in mice, finding reductions in liver fibrosis that are similar to other leading drug candidates in development. Prof. Gallay also has studied anti-cancer activity of CRV431 in NASH mice. After 10 weeks of treatment following evidence of liver tumors, the study found a 44% reduction in tumor numbers and 52% reduction in tumor score, significantly impacting overall tumor burden. Prof. Gallay now is conducting further studies on CRV431 in liver disease. Dr. Foster is hopeful that one or more HBV markers will show responses to CRV431 in the small Phase 2 pilot trial to begin in December. In parallel with that trial, planning is underway for a 90-day toxicology study in animals that would support moving into longer Phase 2 hepatitis B or NASH trials. Expansion into NASH will require either a new IND filing or at least amending the company’s current IND to facilitate a study in these patients, he adds. To connect with ContraVir, or any of the other companies featured on BioTuesdays, send us an email at editor@biotuesdays.com.